Case studies for Civil Engineering firms. Why are they so beneficial? Two of my legacy clients merged to form TruLine Civil in 2011, I branded the merged civil engineering firm and developed a market positioning strategy in collaboration with the projects manager. To set TruLine apart from the crowd and influence the way their target audience perceives them we chose to emphasise the distinguishing feature of the firm, their methodology for completing civil works. 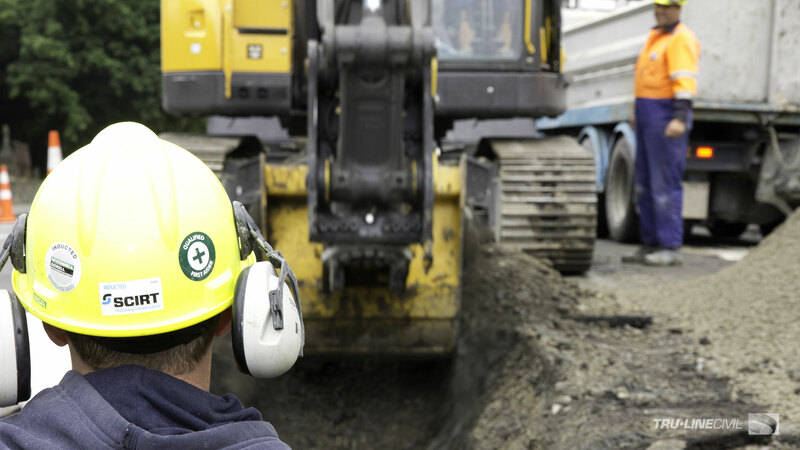 Civil works methodology is a suitcase term, which when unpacked is the TruLine system of methods, this goes to depth and breadth of staff education, their training and hands-on experience, problem-solving skills, use of good judgement, creative thinking, and the ace up their sleeve, the firm’s exemplary level of employee retention. By creating their first website around that core of Civil Engineering case studies, including documentary photography, the meaning behind the brand’s mission “Excellence in Infrastucture” is shown to be backed-up by a reputation and ranking in the industry that is earned. The case studies project commenced in 2006 with documentary photography of their works for use in a suite of marketing collateral, and a custom Word document for tender bids, which they edit and publish in-house. The marketing strategy was that in the competitive tendering context their bids get put to the top of the pile, they win more contracts and they grow. Between 2011–2015 the firm doubled in size from 25 to 50 employees. The core of the new brand and identity system is the new Tru-Line logo I designed. The identity system is followed through on the website which is populated with MagentaDot Brand’s photos and content written in a collaboration with TruLine’s Projects Manager. I was responsible for populating the site for the launch, and maintaining the site since as required. In 2008 TruLine Projects Manager Geoff Powell commissioned me to team up with him in order to develop a professional journal of Case Studies focussed on TruLine’s methodologies. Between 2008–11 this involved documentary location photography of completed projects from Punakaiki to Arthurs Pass. Since 2011 Geoff in his new role at TruLine selected Work In Progress for photography and video that cover the the gamut of TruLine’s strengths and capabilities. Case studies are the very best way to add credibility and showcase the breadth of TruLine’s civil works authority, expertise and innovation. Done right, the case studies have been providing the deciding evidence that customers need to get them over the line to engage TruLine’s services. Why are case studies so beneficial for civil engineering firms, and how do we know we’re doing it right? Case studies are of particular importance in the competitive field of civil engineering as the success of TruLine’s projects is based around accurate analysis, problem solving from experience and innovating with creative solutions that save the client time, materials and money. Illustrated custom maps for the case studies allows sales leads to quickly understand the project in overview, and the sub-tasks that make it up. Civil engineering clients are best shown as well as told about real-world examples of how TruLine has engineered solutions for people just like them. My professional photography, video and infographics of men and machines at work makes a real impression. Work in progress along with completed project photos enables the different stories to be written in a way that allows clients to quickly understand how TruLine is able to deliver and exceed expectations on their project goals. The TruLine case study documents, have also been laid out and desktop published as a set of A4 print documents, wire-o bound. Clients want to see documentary evidence of TruLine’s cutting edge abilities. We achieved this by using a variety of case studies that outline different skill sets, each of them I have diligently researched and written, conducting my own learning programmes relating to each project. This approach has resulted in stories that allow TruLine’s clients to quickly understand just how they are able to be of use to them in achieving their own project goals. TruLine’s project case studies are web content that confers considerable marketing advantage. Technical writing & research for TruLine Civil’s ongoing series of Case Studies. 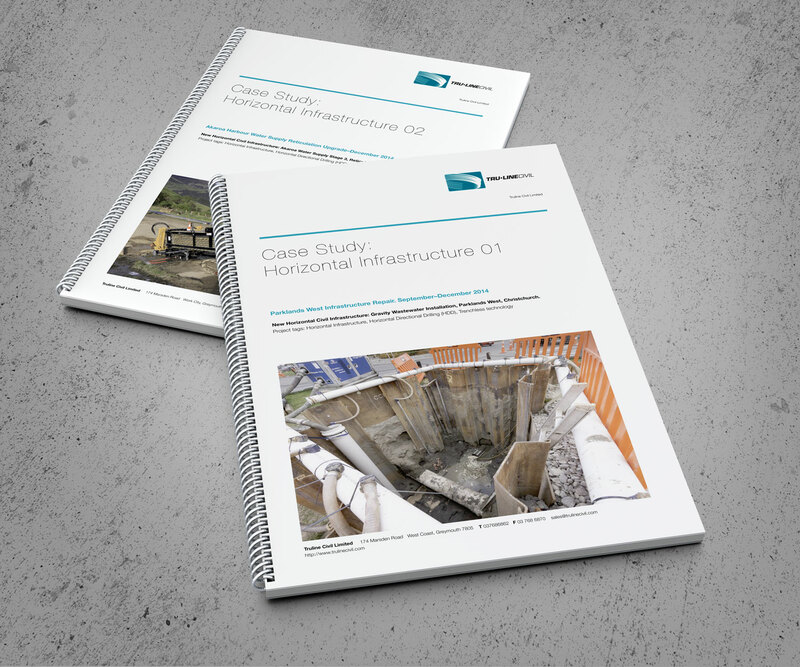 The Case Studies are broadly themed around TruLine’s unique civil engineering methodologies as applied to specific projects. This is the list of case studies I have researched & written, photographed and videoed for TruLine Civil between 2006–2016. Pipes that form the water supply network, the wastewater or sewer network, and the stormwater drainage network. Links open in new browser tab. 01/Stream Culvert under Embankment, Magdala Link. 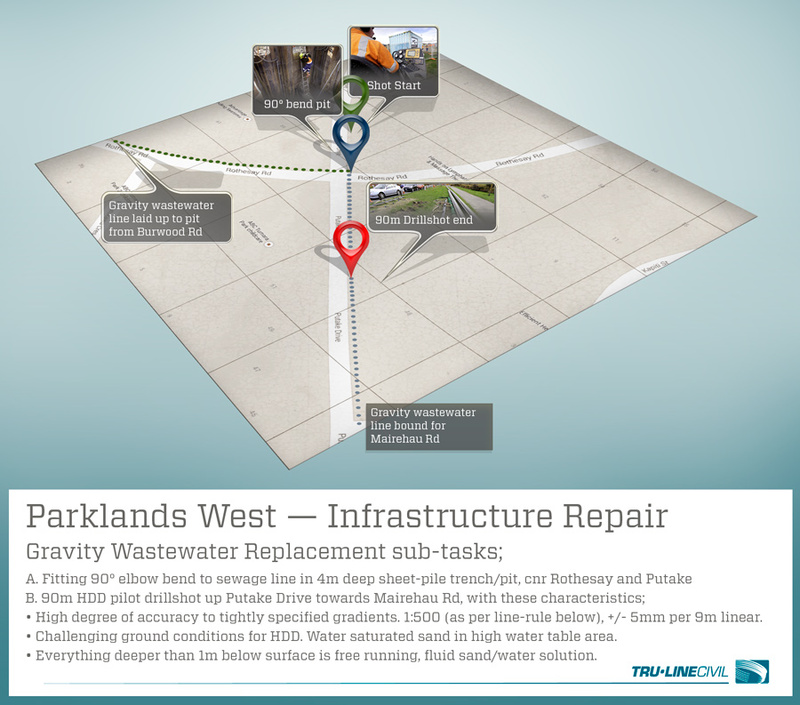 02/Trenchless Technology: Horizontal Directional Drilling – Akaroa Harbour Water Supply Reticulation Upgrade. TruLine Civil excavating Barbadoes Street, new waste water main pipe lay, linear metre record setting day. Post quake horizontal infrastructure rebuild, central city Christchurch. 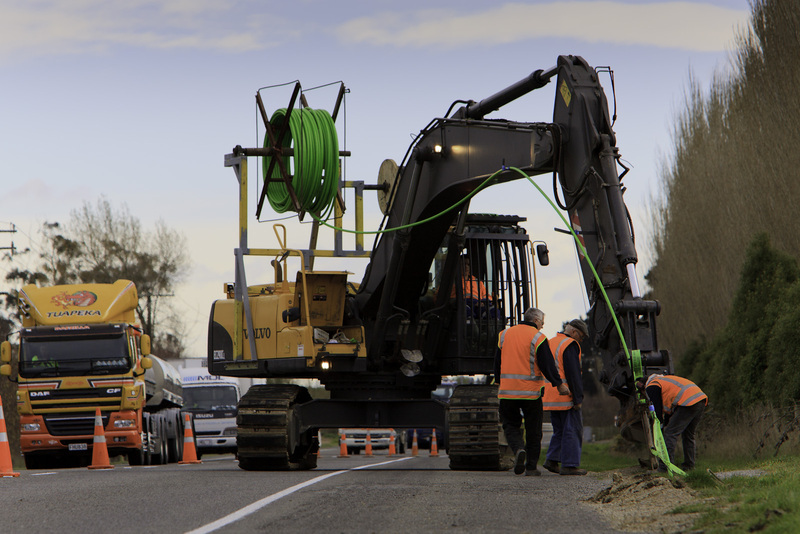 Fibre-optic cable laying to install Ultra Fast Broadband networks. 07/Ultra-Fast Broadband Initiative Roll Out, Nelson. Hydraulic Excavation video. 08/Project KAREN UFB Cable Lay. Port Underwood, Makikihi, Leith Valley. Project KAREN (Kiwi Advanced Research and Education Network) links all New Zealand’s Tertiary and Crown Research Institutions via UFB from Auckland to Invercargill. October 2010. Geoff supervising the laying of Ultra Fast Broadband cable on SH1 near Makikihi. Part of Project KAREN (Kiwi Advanced Research and Education Network) linking all Tertiary and Crown Research Institutes. TruLine’s experience spans the professional disciplines of structural, civil and transport engineering in the assembly and building of bridges, streets, townscapes & landscapes – the substructures, superstructures and the horizontal infrastructure in-between. 09/New Civil Structure: A Reinforced Earth® retaining wall, part of the Wigram–Magdala Link Highway upgrade, Christchurch. 10/Arthurs Pass Bus Terminal siteworks. 12/SH73 Arthurs Pass (Mingha Bluff realignment). 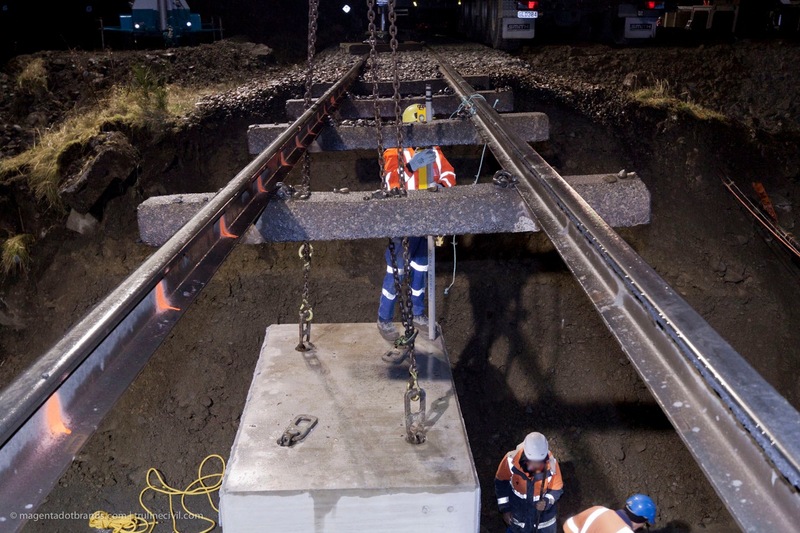 Precast concrete box culvert installation beneath main trunk railway on Otira river bed. TruLine Civil works against the clock to place a new 2.5m square culvert beneath main trunk railway on bed of the Otira River, Arthurs Pass. 13/Iveagh Bay Terraces | Lake Brunner. Roads, bridges, culverts including walls, roading structures and utility work not meeting the definition of vertical. 16/Rocksaw Road Widening, Matiri Narrows near Murchison (Rocksaw road widening video). 17/Maruia Highway resurfacing, Lewis Pass.